New appointments and reappointments have been made to Kew's Board of Trustees. 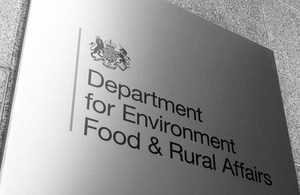 Defra Ministers have appointed Krishnan Guru-Murthy to the Board of Trustees of the Royal Botanic Gardens. They have also reappointed Catherine Dugmore and Nick Baird for second terms. RBG Kew is an Executive Non-Departmental Public Body created under the National Heritage Act 1983, is sponsored by Defra. The Board of Trustees comprises a Chairman and eleven members. Trustees provide non executive leadership and support to the executive through regular Board meetings, committees and groups. Krishnan Guru-Murthy’s appointment is for 3 years and will run from 1 July 2018 to 30 June 2021. Catherine Dugmore’s and Nick Baird’s reappointments are for 3 years and will run from 1 June 2018 to 31 May 2021 and from 1 November 2018 to 31 October 2021, respectively. The appointments have been made in accordance with the Ministerial Governance Code on Public Appointments. All appointments are made on merit and political activity plays no part in the selection process. There is a requirement for appointees’ political activity (if significant) to be made public. The appointees have not declared any significant political activity in the past five years. Krishnan Guru-Murthy is a presenter and reporter on Channel 4 News and on Channel 4’s Unreported World. He was previously a presenter and reporter for the BBC. He is a member of the executive committee of the Edinburgh Television Festival and a patron of Duchenne Children’s Trust. Catherine Dugmore is a qualified Chartered Accountant. From 1988 to 2002 Catherine worked at PricewaterhouseCoopers, latterly as an audit partner based in Johannesburg. In addition to her role as a Trustee of the Royal Botanic Gardens, Kew, Catherine is a Board Member of Natural England and a Trustee of WWF-UK. She has worked in the NHS since 2012 and currently holds a non-executive role at Hertfordshire Partnership Foundation Trust. She was formerly Vice-Chair and Trustee of Action for Children and Chair of Victim Support. Nick Baird is currently Group Corporate Affairs Director of Centrica plc. He previously had a long and varied career in Government, his roles including CEO of UK Trade and Investment, Director General in the Foreign and Commonwealth Office leading its work on Europe, the global economy and consular issues, and British Ambassador to Turkey from 2006 to 2009.